His mission: to create a fair place for island farmers to sell their goods and thrive. Previous owner of Envy BioFuels. LEED Certified Builder. Founder of the Hawaiian Ola Beverage Company. Raised on the island of Molokaʻi, Naehalani works to foster positive growth in the community. As Co-founder and CEO at Hawaiian Ola, she knows what it takes to run a successful beverage brand. Over a decade of experience with startups as a founder and CTO. Launched and developed a medical infrared lab analysis platform and an early breast cancer detector. Now the oracle of Hawaiian Ola. $1,000+ Exclusive Investor Shirt and Hat and -5% discount in Ola Brew taproom 5% discount off our online shop - A free tour and guided tasting at Ola Brew Co. - A free draft Ola Brew on your birthday! $10,000+ Dinner pairing with one of our incredible Island Chefs and our delightful brews! 5% discount in Ola Brew taproom -5% discount off our online shop - A free tour and guided tasting at Ola Brew Co. - A free draft Ola Brew on your birthday! $15,000+ Be the first to taste a specialty batch, send us notes, and you will be a part of our process to make a product worthy for the retail store shelves! -5% discount in Ola Brew taproom -5% discount off our online shop - A free tour and guided tasting at Ola Brew Co. - A free draft Ola Brew on your birthday! $25,000+ A day in the life! Come join us for a day in the life! 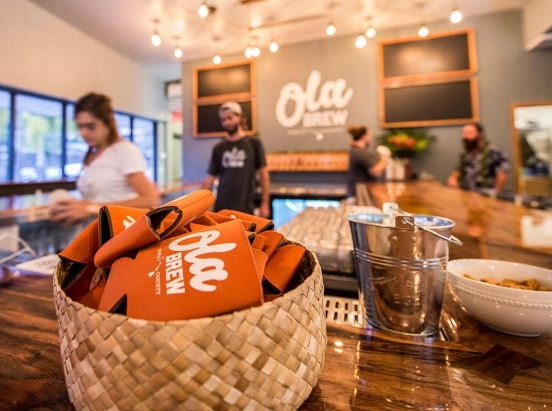 Get the inside scoop on Ola Brew Co -5% discount in Ola Brew taproom -5% discount off our online shop - A free tour and guided tasting at Ola Brew Co. - A free draft Ola Brew on your birthday!